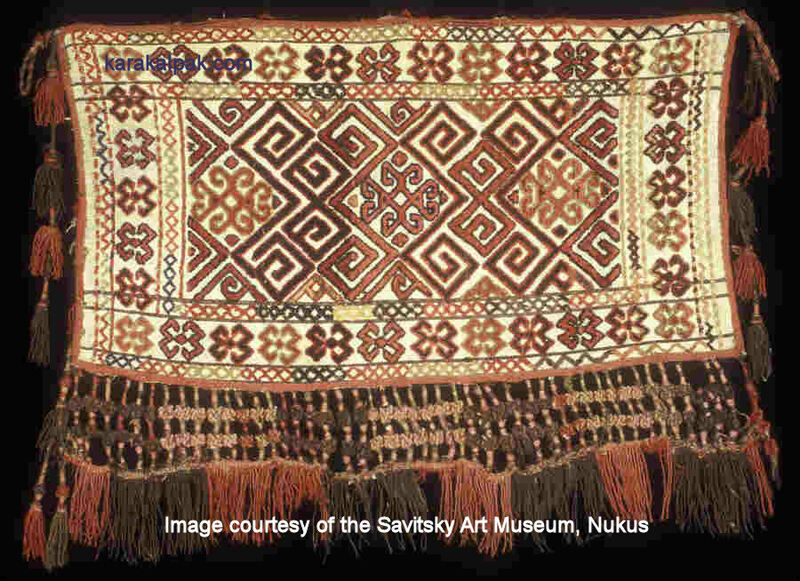 The most dramatic bag woven by the Karakalpaks was the kergi, a flat rectangular bag that was hung on the kerege lattice wall of the yurt and held the household plates and cutlery. Kergis are quite rare and were generally only found within the yurts of wealthy Karakalpaks. They are the equivalent of the large Turkmen chuval although some of them are longer and narrower like the Turkmen torba. "Red carpetwork bags decorate the yurt a lot; they are used for keeping clothes, dishes and small things; they are put on trunks or hung on the kerege. ... There are two types of bags for clothes: kerge and bukd'jama. The front side of the kerge is made of carpet or dark wool cloth; the bottom part is decorated with a fringe and tassels." According to Tatyana Zhdanko in “Karakalpak Ornamental Folk Art”, carpet kitbags, or kerge, were rare in the everyday life of the Karakalpak people; she mentioned that most of them were made from strips of carpet with relief ornament, sewn together side to side. In museum collections the majority of kergis are not actually of this type, their fronts consisting of a single integral weaving. Note that both of these Russian scholars use the Russian spelling kerge as opposed to the Karakalpak spelling kergi. Some Karakalpaks made rustic kergi bag faces by sewing together fragments of basqurs, janbaw, and suwag'ars. 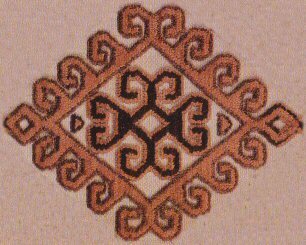 Knotted pile kergis are rarer still and tend to be decorated with patterns that are distinctly Turkmen rather than Karakalpak. Yet from the known provenance of some of these bags, many were clearly woven by women belonging to established Karakalpak clans. It is clear that many of the patterns used were copied from the neighbouring Turkmen tribes. This site was last updated on 4 February 2012.